Luxurious, velvety San Cristobal is made from the purest, most natural ingredients, sourced from the Dominican Republic. The finest cocoa and cane sugar are expertly blended to create a drinking chocolate that’s exceptionally creamy and, thanks to its high cocoa content, more-ishly chocolatey. Fairtrade. Good Housekeeping food awards 2013 - winner best ethical brand. Add milk. 100% natural ingredients. 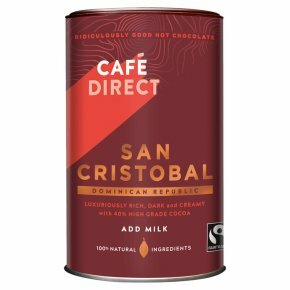 This product is gluten free.Luxuriously chocolatey, sublimely creamy & always direct from the growers Real Taste Luxurious, velvety San Cristobal is made from the purest, most natural ingredients. The finest cocoa and cane sugar are expertly blended to create a hot chocolate that's exceptionally creamy and, thanks to its high grade cocoa content, more-ishly chocolatey. How to Make the Perfect Hot Chocolate Add 3 heaped teaspoons to a mug and mix with a little milk to form a smooth paste. Add hot milk or, if you're using a microwave, add cold milk and microwave for approx 2 minutes. Stir well, relax and enjoy a few minutes of chocolatey bliss.